An unannounced yet LG handset carrying the model number LG L56VL has just passed through the FCC certification process. 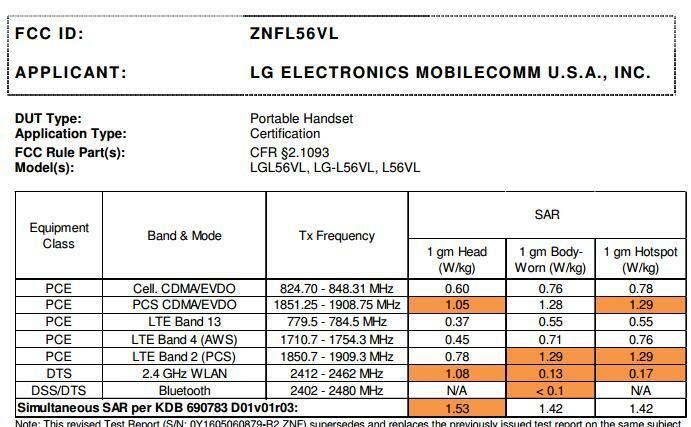 According to LG L56VL SAR test report, the dvice Supports 4G LTE bands B2, B4 AND B13. The FCC doument does not mention the dimention of the LG L56VL. The LG L56Vl is a mid-range smart phone that will be available from Tracfone,net10 and Straight Talk. It seems that Tracfone will release more LG devices this year, We have seen the LG Stylo2™ LTE (L82V/L81AL),LG Premier™ LTE (L62VL/L61AL),LG Treasure™ LTE (L51AL/L52VL), and LG Rebel™ LTE (L43AL/L44VL) at Walmart online Store. The Upcoming LG l56vl is a CDAM device., It should be available in Q3, 2016.